So far, it has mostly been chilly out, with the odd miniature snow squal, if we can call it that. The things that make Paris magical in the winter are the markets and the traditions you can see unfolding all over the city. I visited the winter market on the Champs-Elysées, where I drank "vin chaud" (hot red wine - mulled like a cider) and saw the official lighting of les champs for the season. I was honestly hoping it would be more moving than it was, but nevertheless it was beautiful. 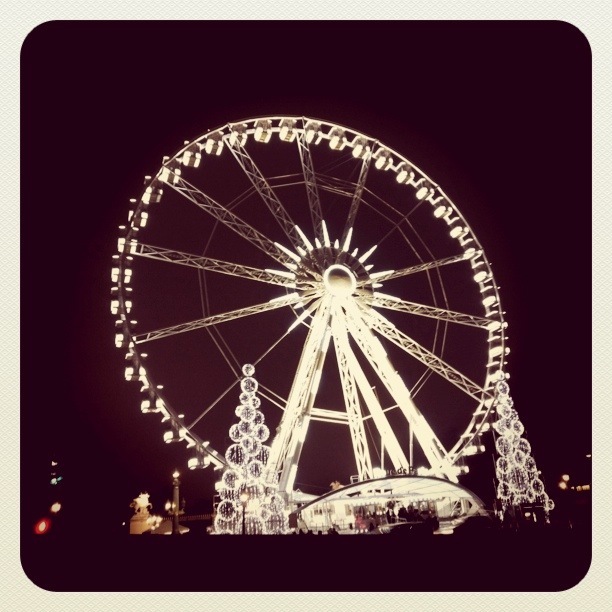 At Concorde, there is a giant ferris wheel, almost like a mini London Eye, that you can ride and see the entire city from the top - it is on my list of things to do before I come back to Toronto mid-December. It looks amazing from where I walk most days - so I took a picture for all of you to see. I think most of us would agree that with Christmas comes famimly and this year I am far from mine for the moment. Just when I needed a little break from the city and the commotion, I went to visit my friend Thibaut's family, who always take me in like their own and make me feel at home. On the weekend, when I visited, I spent a good part of the day doing little things with Thibaut's mum. 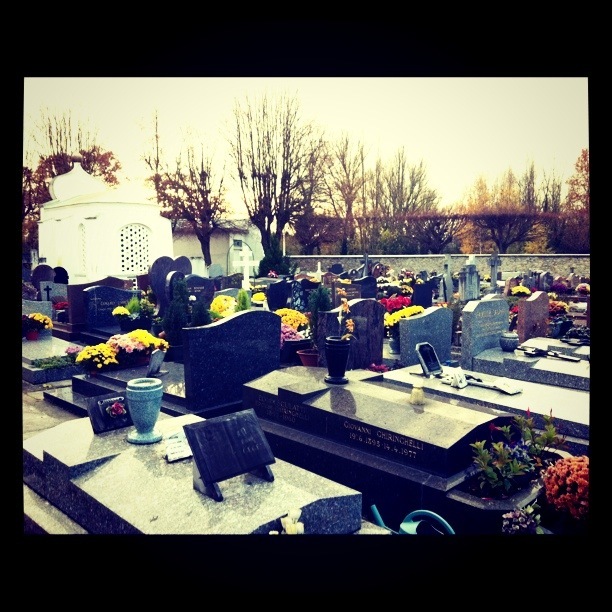 She made us all a delicious lunch, and then took me to see this famous Russian cemetary in Sainte-Geneviève-des Bois. It was beautiful, with all of the Orthodox crosses, flowers and religious momentos , like coloured eggs and miniature crosses in little windows built into the graves. 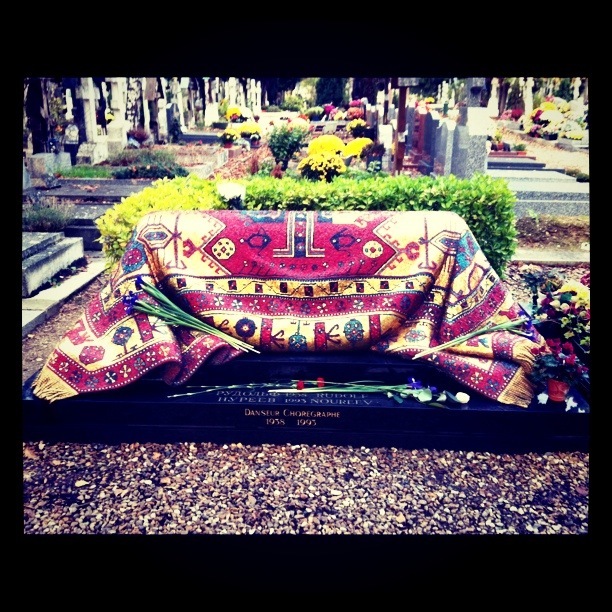 There are princes and princesses buried in this cemetary as well as many Russian writers. More notably, Noreeve, the famous dancer is buried there, and the grave is magnificient. 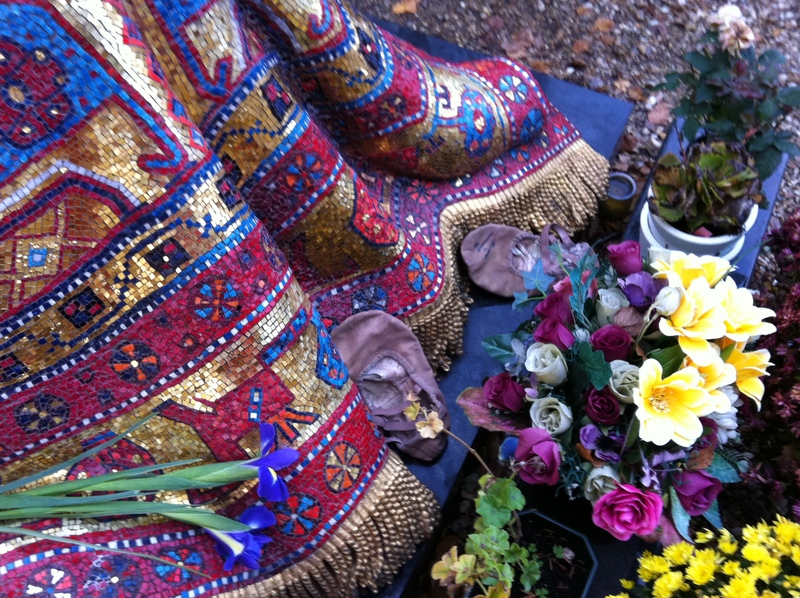 A tapestry created from mosaic tiles covers the grave, fresh flowers and even a pair of worn out ballet shoes from a fan lay all around the grave. 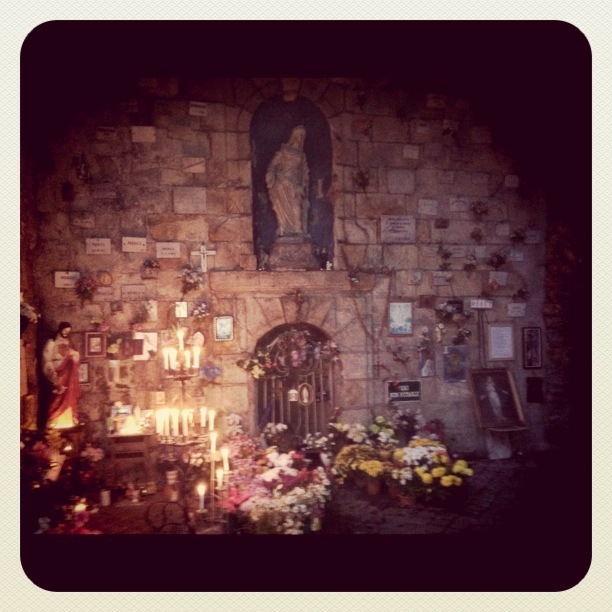 This cemetary, unlike others that I have visited, had a very peaceful ambiance, almost welcoming. To continue with the religion themed visits, we made a quick stop the La Grotte de Sainte-Genevieve. I had no idea what a grotte was, but was very happy to have found out. 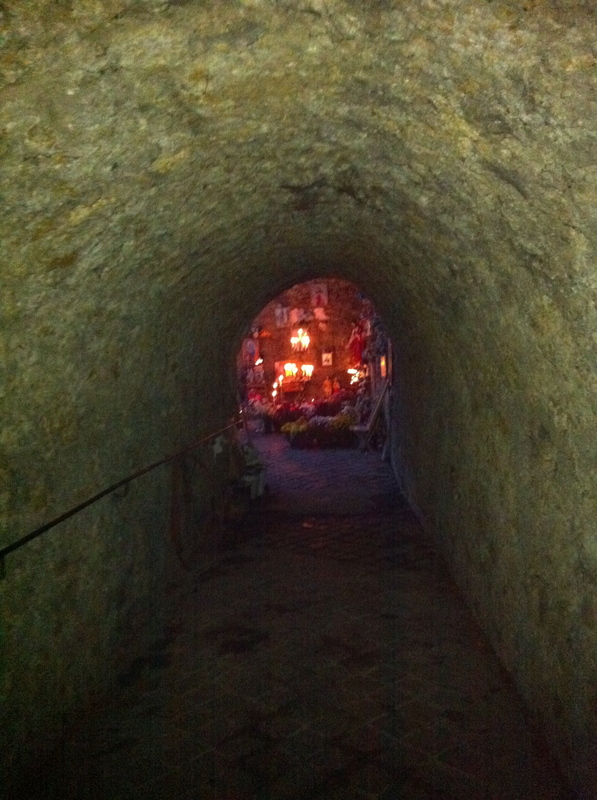 For those of you like me prior to my visit, a grotte is like an underground space where people go to pray, light candles and thank god or a sainte for example. We walked in through a dark tunnel, and at the end, was a corner filled with candles lit in rows and circles, religious icons, thank you letters and flowers. A park bench sat in front of an enormous tree, a tree that has grown so tall and old that it has busted through the roof, forcing them to remove it. I can understand why someone would come here to think or pray, it is, despite being just off a busy street, a very peaceful and beautiful space. Once back at the house, I sat by the fireplace to warm up, and to my surprise, Thibaut's mum and dad brought out a bowl of chestnuts they had picked a couple of weeks prior. 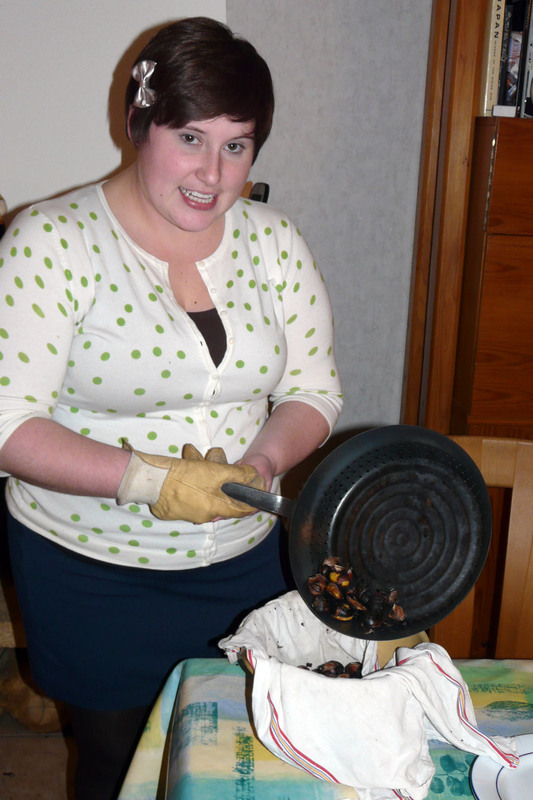 We prepared the iron pan and for the first time ever, I roasted chestnuts. It was a day of firsts. 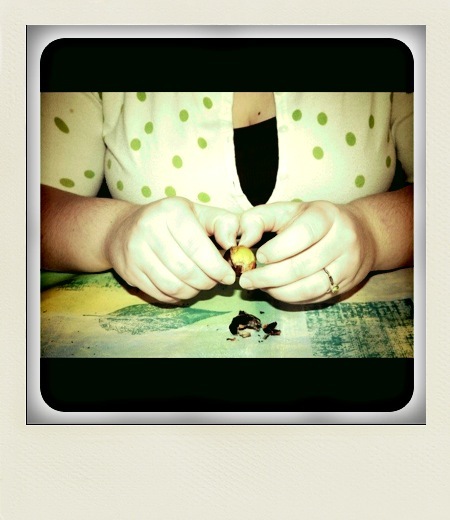 I then tasted roasted chestnuts for the first time, and am in love with them. They are so delicious and smooth to eat. It is a bit of a process to get to the step of eating but definately worth it. We never see this in Toronto, or Halifax for that matter, but in Paris, roasted chestnuts can be found all over the city, sold by guys on the street with shopping carts padded with embers and pans atop the embers with chestnuts roasting slowly. It certainly makes Paris smell delicious, which I can assure you is a welcome change.